Learning how to use a basic color wheel can help you choose fabrics for your quilts. Don't let a color wheel dictate the colors you choose—just keep in mind that it can help when you aren't sure where to turn for inspiration. A color wheel is a chart that helps us understand the relationship between colors to help guide you to logical fabrics when you're unsure which colors to choose. Forget about all the rules you've heard about colors that do and do not match because any color will work with any other color when we experiment with different variations of each. One glance at scrap quilts and a look at string quilts are proof of that. Blue, red and yellow are all three called primary colors because they are the basis for every other color. Mix them together in different ways and you can create any color on the color wheel. The three primary colors are arranged at equal distances from each other on the most commonly used simple color wheel. The three secondary colors are located midway between the primary colors. Secondary colors are created by mixing together equal amounts of the nearby primary colors. 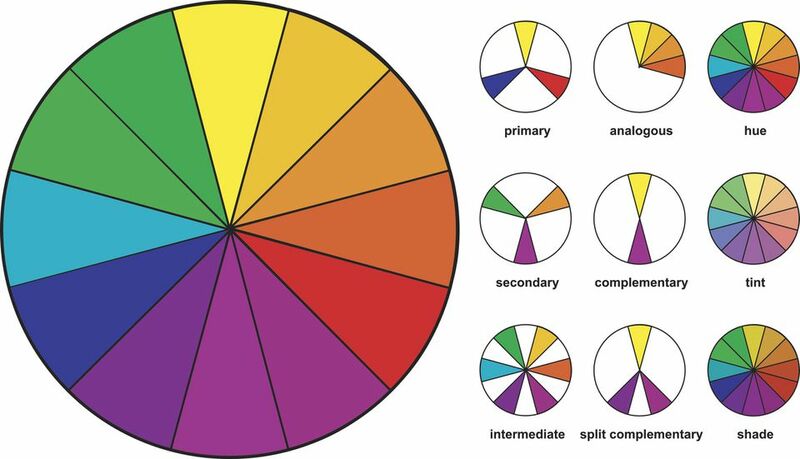 What Are Tertiary Colors on the Color Wheel? The type of color wheel we're using displays pure colors, but most of the quilting fabrics you'll use will most likely be altered versions of pure colors. Shades are created by adding varying amounts of black to a color to make it darker. Tones are created when gray is added to colors, resulting in colors that are less intense versions of their pure versions. Tints are created by adding white to a pure color to make it lighter. Dominant colors are the first colors we notice when we look at a quilt. Color dominance in quilts is complex because it depends on the overall combination of fabric selections, but there are a few easy ways to predict how quilting fabrics will interact with each other. Pure colors are more dominant in a design than toned colors containing gray. Yellow is the most dominant pure color. Warm colors, on the right of the color wheel, are more dominant than the cool colors on the left side of the color wheel. Darker patches are often more noticeable than light patches, so they can be used to create contrast in a quilt, but color warmth can step in and make the darks recede. For instance, which patch is most noticeable when placed side-by-side, a bright red or a black? It's usually the red. Experiment with your own fabrics to see which is most dominant. Using a design wall makes it simple to step back and view fabrics from a distance. Extremely light fabrics used as random, infrequent accents often move forward in the design, making them more noticeable than dark fabrics. Traditional Amish quilters used that technique to add sparkle to their quilts. Value (contrast) is just as important, and sometimes more important, than the color itself. Neutrals are very weak colors that allow other colors to move forward in a design. Quilters often use neutrals for backgrounds or in other areas of the quilt they want to be less noticeable. Variations of gray and beige are considered neutral, and so is black when it acts as a backdrop for vibrant colors—like the Jewel Box quilt pattern. Even though white is a neutral, stark white sometimes pops forward in the design. Monochromatic quilts, or quilts made from just one color, needn't be boring. Choose the color you wish to work with first, and then sew with all sorts of light to dark shades, tints, and tones of the color. Add neutrals to the design to create a restful backdrop. Contrast is important for most monochromatic quilts, so be sure to choose a range of fabrics in dark to light. The Double V quilt pattern is an example of a monochromatic design. Hawaiian quilts are often monochromatic. Analogous describes colors that lie side by side on the color wheel. Analogous colors look good together naturally because their color roots are similar. To make an analogous quilt, select fabrics in a focal color, and then choose fabrics from the two colors on each side of the focal. If you like, extend outward and add the next round of colors nearest to the focal color. Try not to use equal amounts of the adjacent colors -- mix it up. Add depth and variety to analogous quilts by including neutrals, plus shades, tints. and tones of the colors used in the quilt. It's often best to use one complementary color in smaller quantities than its partner. For instance, if you select yellow and purple, do not sew the quilt with equal amounts of the two colors. Instead, use one as a highlight, sprinkling it throughout the layout. What Is a Split Complementary Theme? A split complementary layout is made by selecting three colors that are side by side on the color wheel and then adding the color that lies directly across the color wheel from the color at the center of the trio. Forget about all the rules you've heard about colors that do and do not match and go with your instincts.